I have been busy with family this weekend. Don and Rita (DH's Brother and Finance) came down from Riverside on Saturday and left on Sunday. We had a great time with Happy Hour at Tom Hams Lighthouse the afternoon of their arrival and dinner at a fabulous Italian restaurant de'Medici on 5th Avenue in the Gas Lamp District afterward. Lots of catching up conversation ensued over their visit. 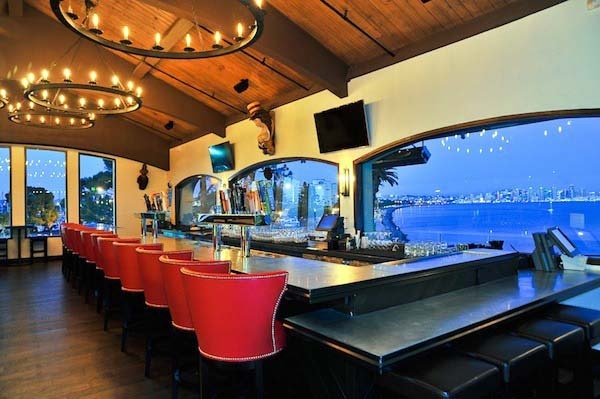 Sunday had us for brunch at Jimmy's Famous American Tavern. First experience of Chicken and Waffles! The weather couldn't have been better. This meant very little sewing to show you today. 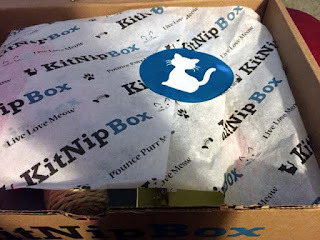 Friday was my day off and Kerry's so lunch at Daphne's in Santee then to her home for figuring out what threads and quilting designs for five different projects that were put in her queue. 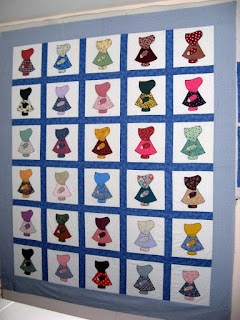 We also spent much time deciding what quilting designs would work best for Kourageous. You may remember this project. I think we landed on four of them to get the quilting going. 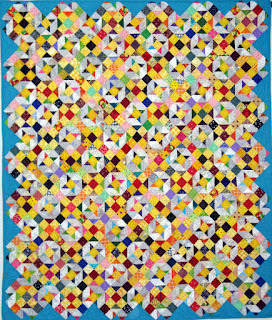 This is the last quilt I entered in the San Diego Quilt Show that will need to be finished before quilt call the last week in September. 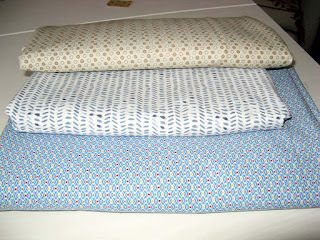 I also came home with Kompass ready for binding. I will need to find something that works; hoping for the dark blue that you see in the middle circle. Promise I will share the entire project once bound. 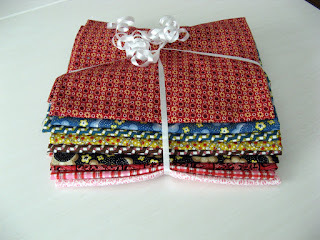 I have been pulling fabrics for the sashing of Kountry Kollection. 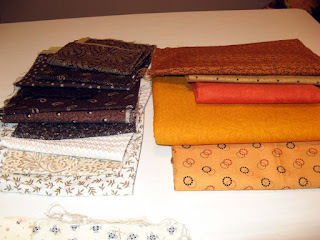 I have several of the original fabrics to use and because it is so scrappy there are many other to consider as well. I only need 10 1/2" x 2 1/2" (maybe just 2") strips for between the blocks with four patches where the sashing intersects. At least this is the design in mind at the moment. Perhaps this will change, but for now this is where the designing will start. 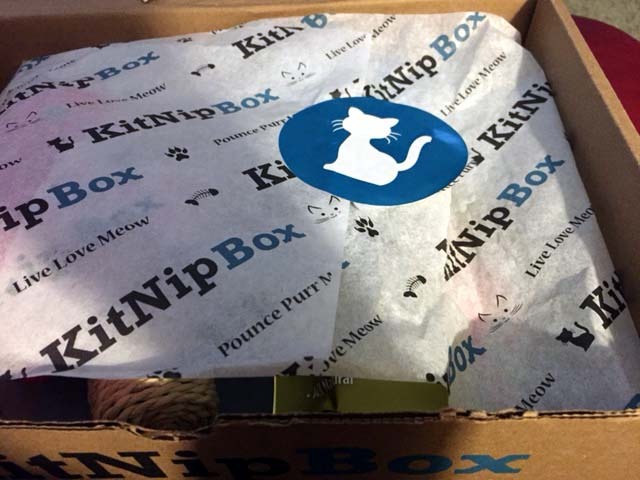 Many of you know that two kittens are soon to be mine. Abyssinians are the breed of choice as were Kaos and Komotion (KoKo). Once you own an Aby you too may be set on having a repeat. Kaos and Komotion are at the Rainbow Bridge now and our home is so empty without them. Kosmo and Katastrophy (Kassy) are eight weeks today. 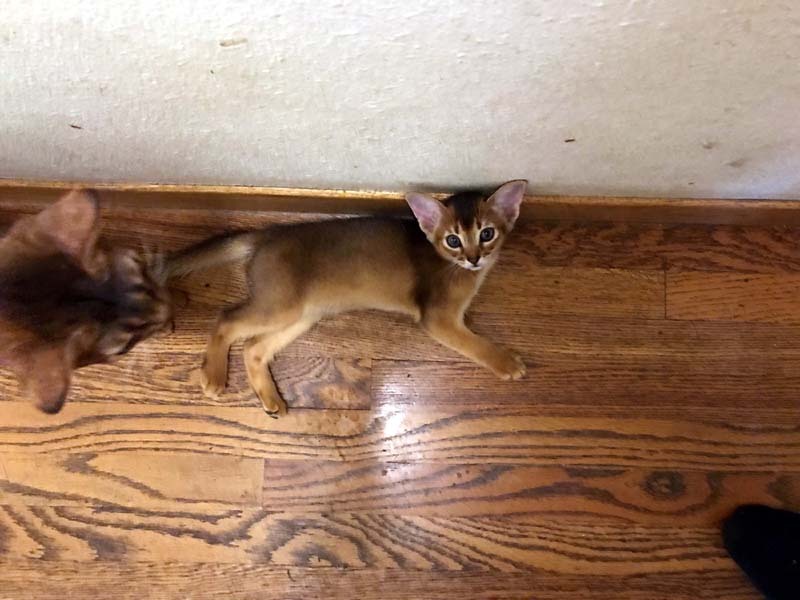 We will be able to bring them home at 12 weeks...but in the meantime pictures are being sent to us. I have my introductory visit arranged for Saturday. Our home will soon hear the romping and meows of these two. I am not sure who is in this most recent photo, but how could you not love this one? Aren't these just too cute? A small departure from quilting for Violet and Ivy. 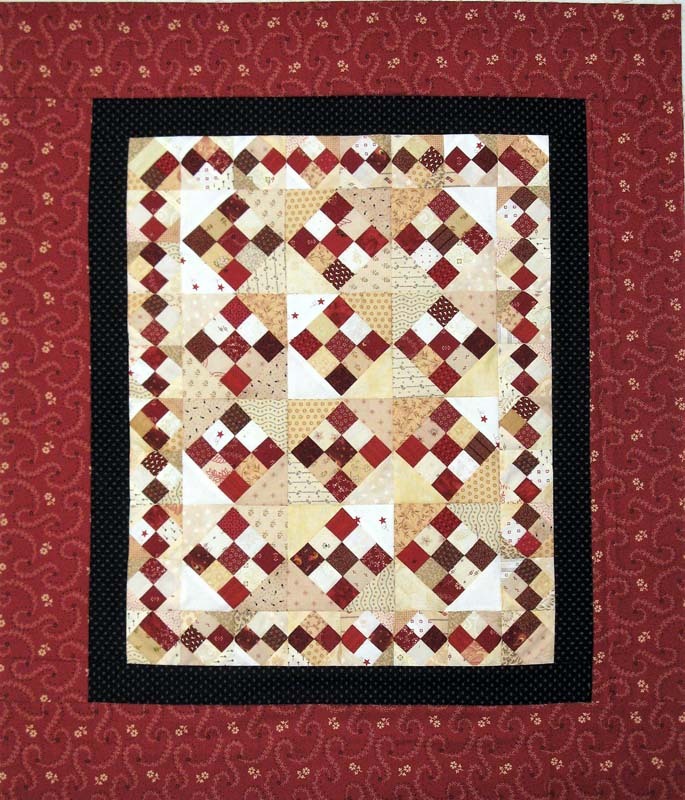 I just loved this pattern since it had the ability to use up lots of scraps. Not one thing was purchased for them, not even the jumbo rick-rack. I'm anxious to see photos of the sisters wearing them. This is the next project I will tackle from my 2017 UFO list. It has yet to be called by Patchwork Times. August 1st is just days away. I wonder if it will be selected to work on for the month. 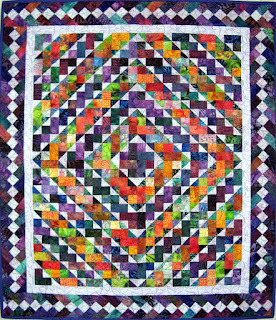 I made the blocks in 2012 as part of a Quilt Square Quilt Along coordinated by Jo's Country Junction. 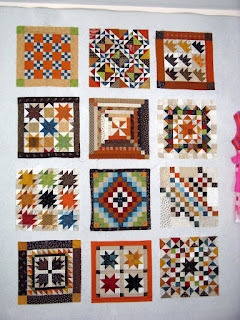 One could do any number of things with the finished blocks. 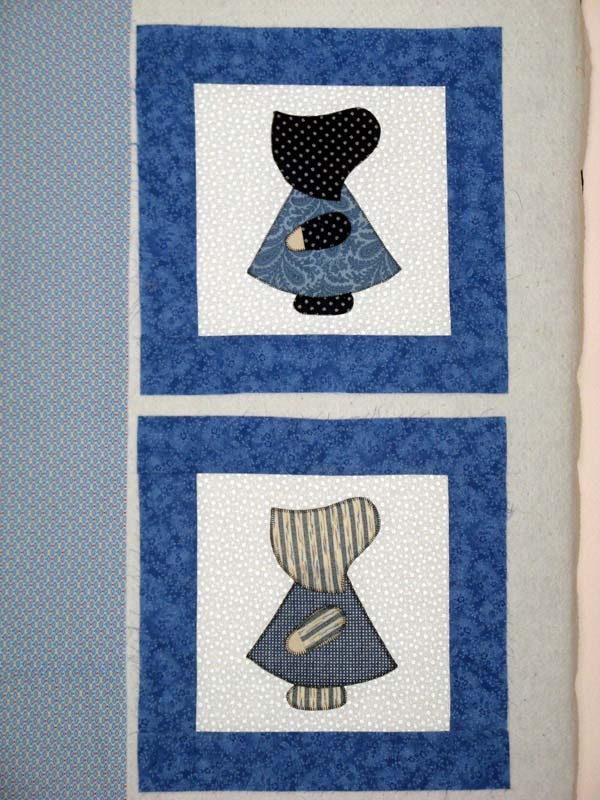 Many made small one block miniatures, but I thought to make mine into a small quilt. 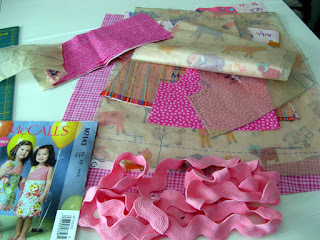 Right now I have loads of fabrics out of their containers auditioning for the sashing. I'll be calling my project Kountry Kollection. 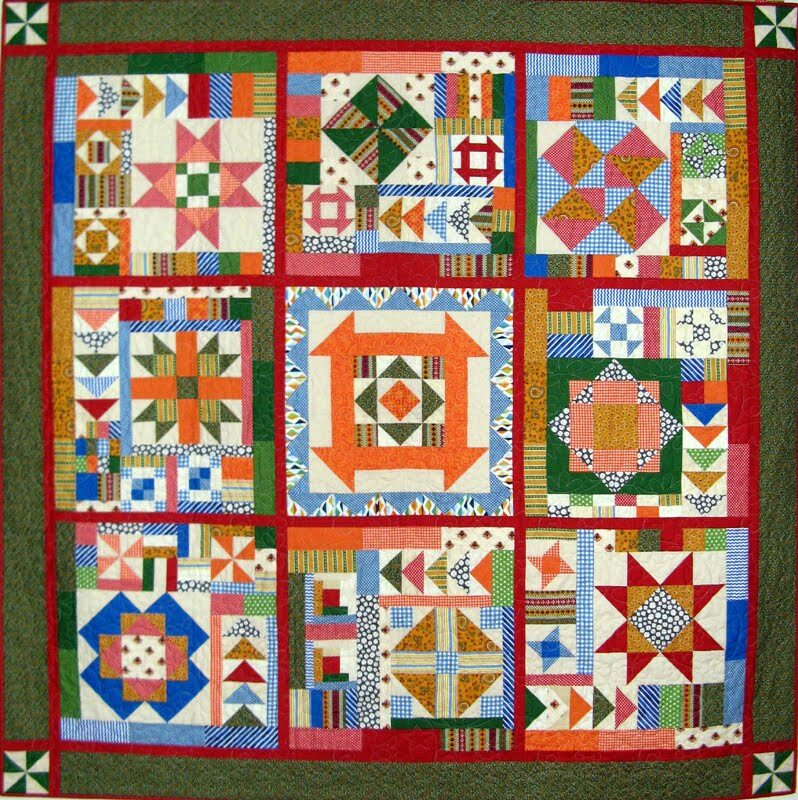 All the blocks are designed by Lori Smith. UFO for July is complete. 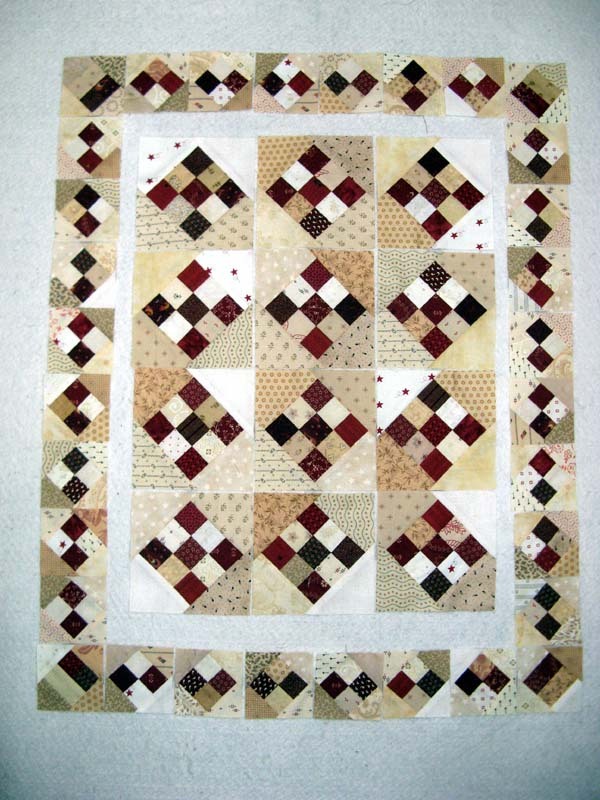 Today the two borders were stitched down. A finish for my Kapture! 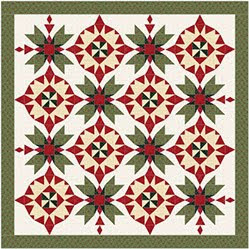 A design by Pam Buda called Four Around Nine. 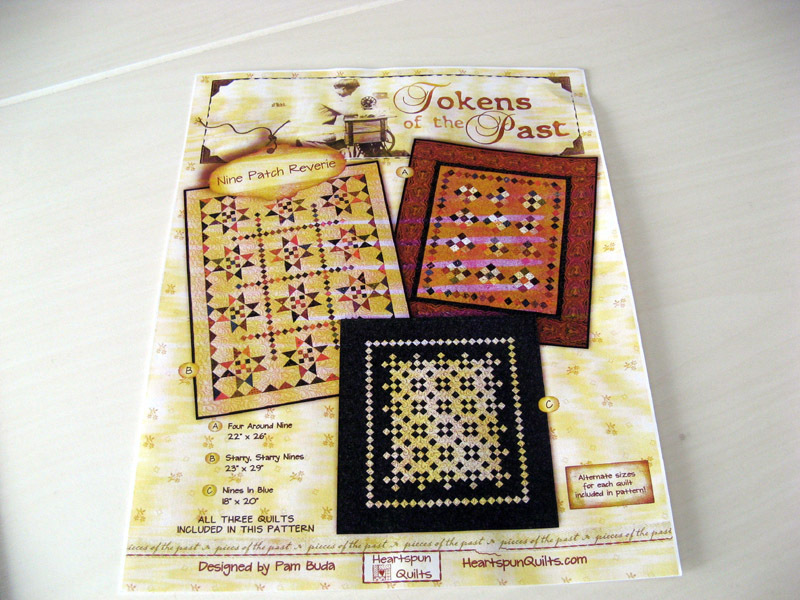 The design can be found in her trio of patterns called Tokens of the Past. All fabrics came from stash...EXCELLENT. 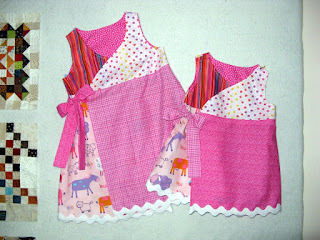 Garment sewing for Violet and Ivy is next. The fabrics are really cute and the EXCELLENT kind as well...straight from my stash. Hope the two like what's soon to be in their closet. I put the same sashing fabric around the pillows that will be finished by Mom. The pillows will finish at 14" square. 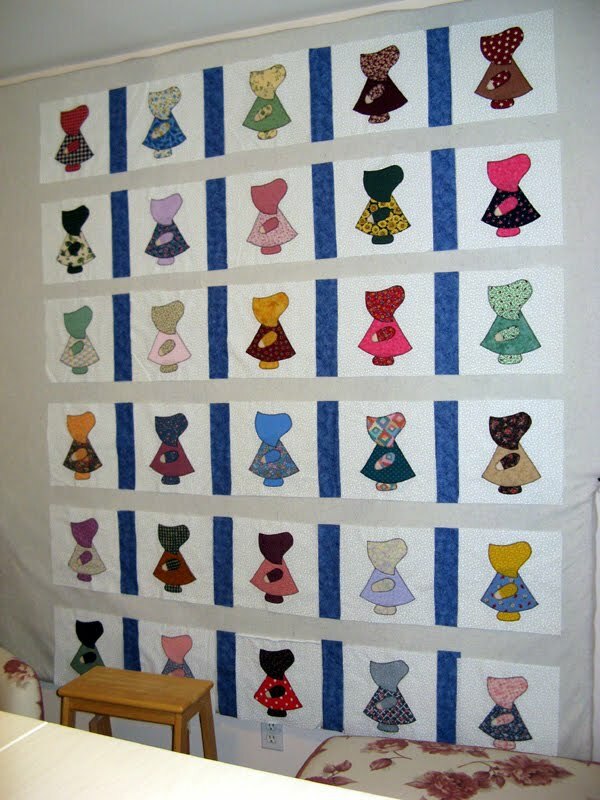 They too will have the same backing as the quilt. 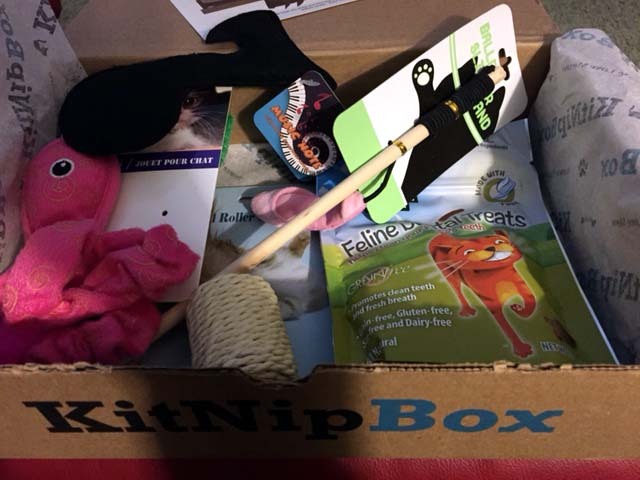 Tiffany has seen the project and is quite thrilled. 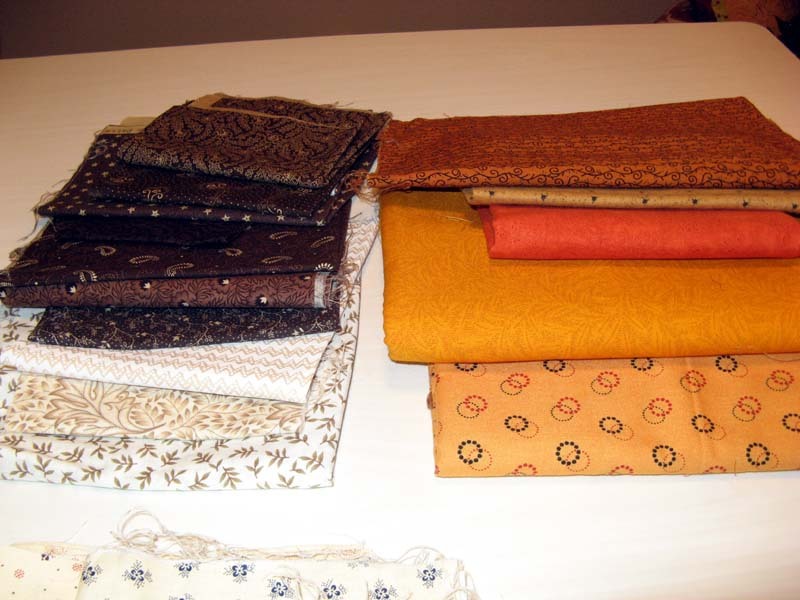 Beverly's had two more fabrics to come home with me. 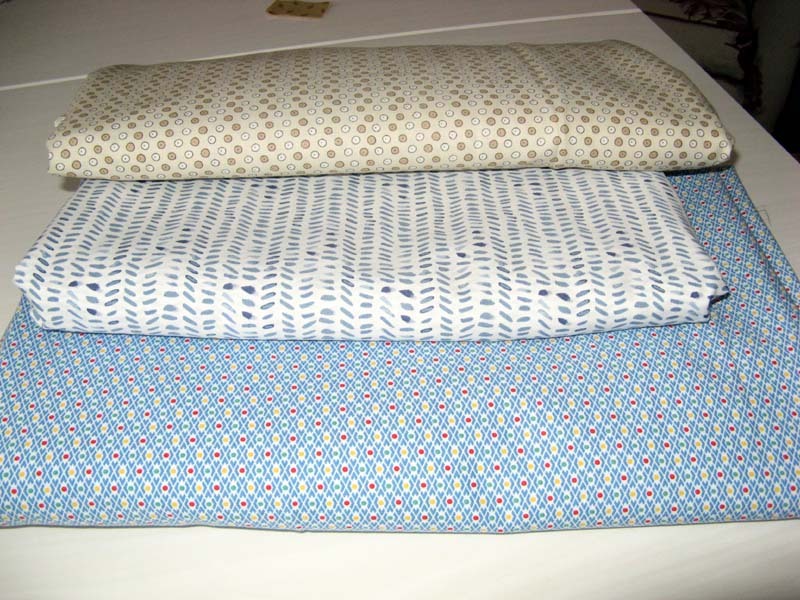 The one on the top was another discounted fabric at $5.00 a yard. The middle fabric is a back for a UFO yet to be started this year. 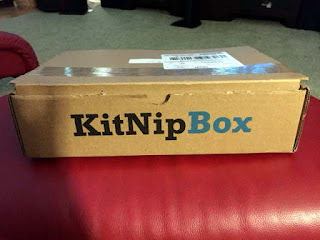 It was purchased with a 25% coupon. 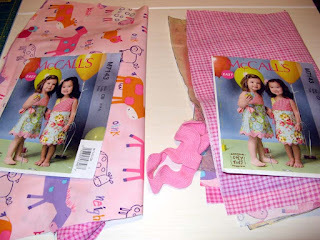 The fabric on the bottom is the border and back for Tiffany's project. Already in and out of my stash so I won't be counting it. The beginnings of Kapture! I started cutting the background neutrals on Sunday. There are not many pieces to this project. 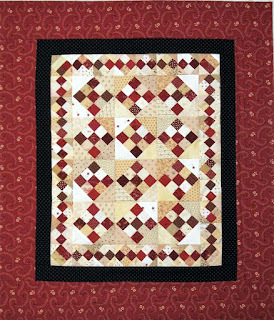 I managed to get just a few of the same print in both of the neutrals and reds. These pieces are tiny... 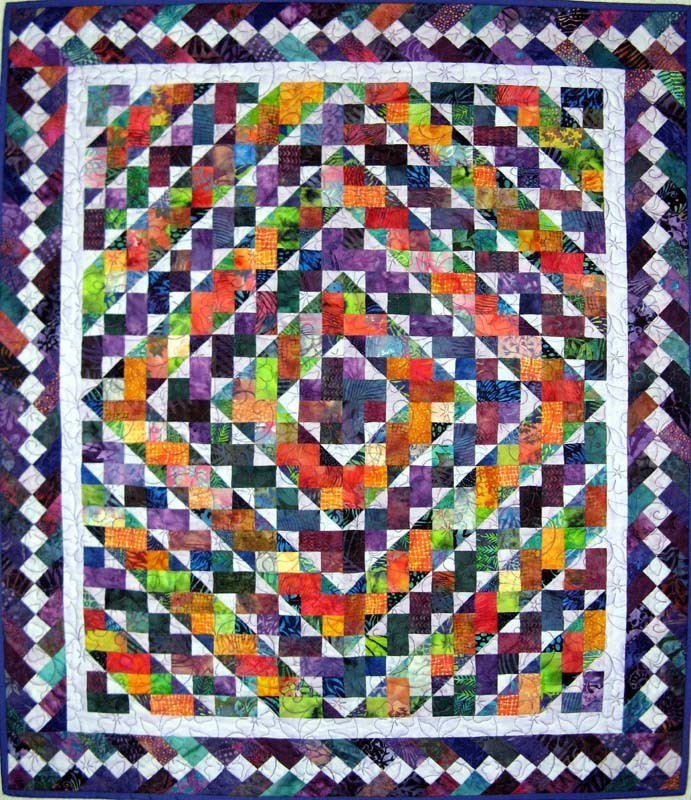 The smallest of the squares is just 1 1/4". 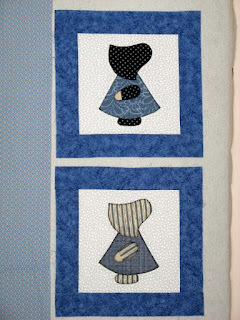 I will be making Four Around Nine by Pam Buda (top right project). Kapture is my July UFO. Many of you learned about my two new fur-babies today. This date marks their five week birthday. I won't be able to see them until eight weeks. They live not far from me in the Los Angels area. It will be the week of my birthday when they move in with us. So excited! Kakes in the Kribyard is finished. Love how this one turned out. The fabric statistics don't change this week. I am sewing though. Enjoy your week ahead. 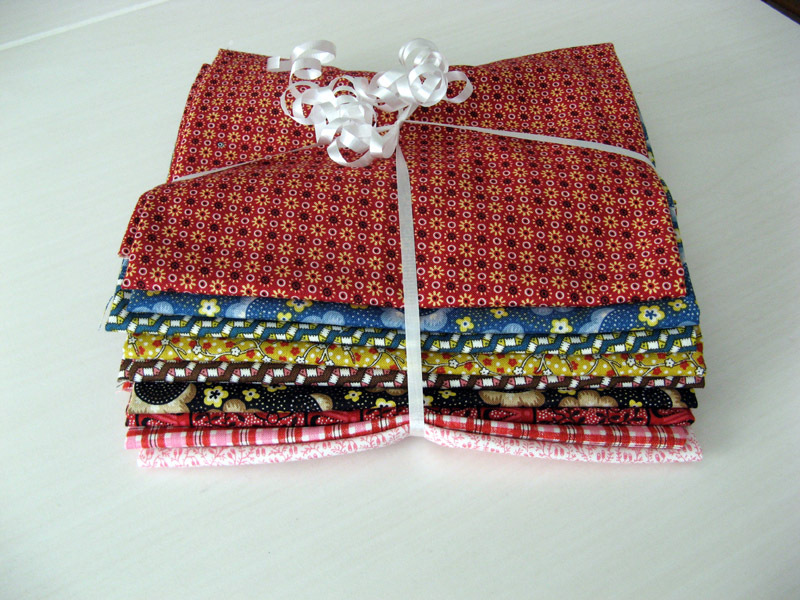 I've been very busy with binding. Knikknakk above was finished on Sunday. Kissin' Korner 2 finished on Saturday too. 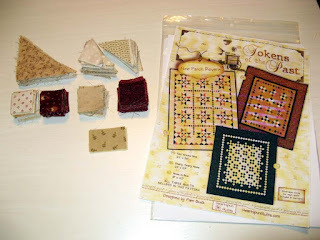 Today I got around Kakes in the Kribyard, but have the sleeve to stitch down. I will show you a photo of it in all its royal purples later this week. 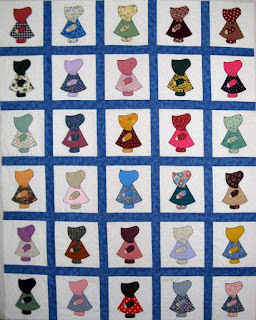 All of my finished projects can be seen on my website www.kwiltnkats.com. 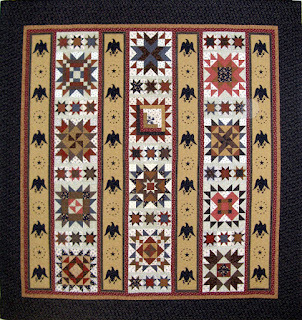 There were ten Sues to be blanket stitched down when I was left with this project started by Mom a very long time ago. Tiffany pulled out two of the primarily blue Sues for pillows, but the rest make just enough for this setting. The blue sashing fabric is left from the blue and yellow bed quilt Mom and I worked on and finished =^.^= before she returned home. I will be using this same blue for the sashing in between the rows. There is easily enough for it and probably the binding. Not sure yet about a border or if it needs one. What do you think -or- is it too soon to gather an opinion. 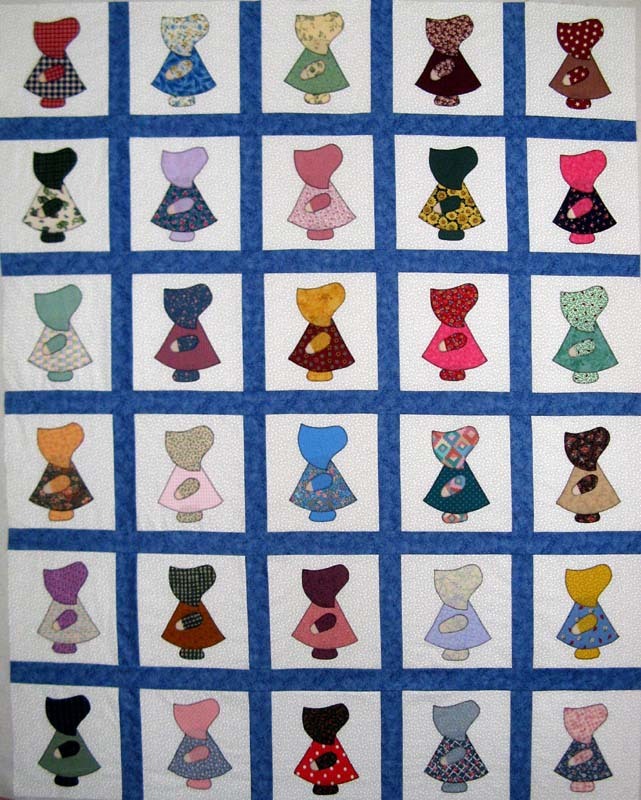 I will be back to Sun Bonnet Sue this week. 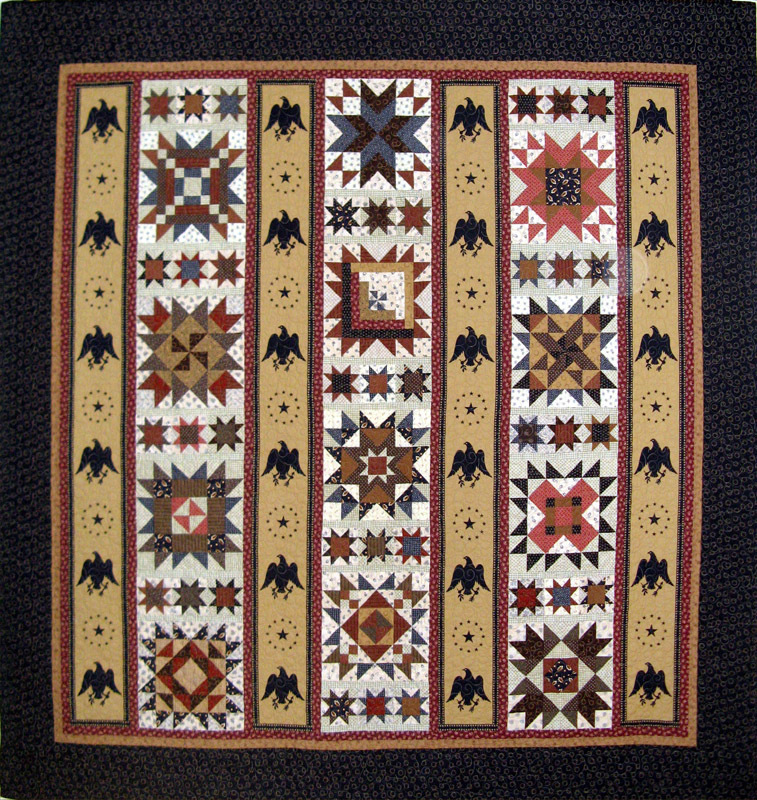 Yesterday was the day to start registering for Road to California Quilt Show classes. I hit the select button minutes after 8:00am. These classes fill up so fast...just after my selections were made I noticed many of them SOLD OUT! Very happy that Kerry and I made the cut for a Wednesday class Magic Mariner's Compass by Janna Thomas of BlocLoc. This is the project we will embark upon. Pretty cool design. I will use another color or two or three... The second class will be on Thursday by a designer we are just learning about. 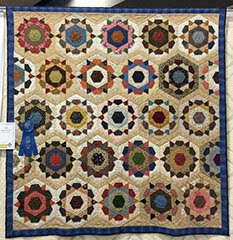 Barbara Black will be leading us through Antique Rose Star. 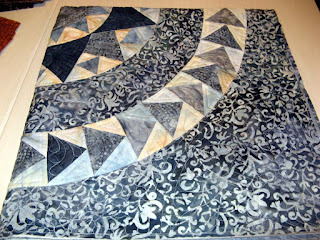 This one involves the dreaded curve piecing. It looks like it might be worth it though. 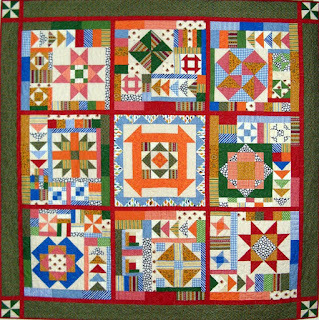 I have three quilts to submit for the show that will be January 18 - 21, 2018. All of them are traditional pieced using the foundation piecing. The talents of seven different designers were used in the making. I learned a bunch of techniques that have been added to my tool box. Go to classes and try things new! Today is a bright holiday! I sure wish we could be sharing this day again like we have the last three weeks with my Mom. Unfortunately, today I am up bright and early driving her to the airport. It has been a great trip this year, but as we've brought up many times today...all good things have to come to an end. 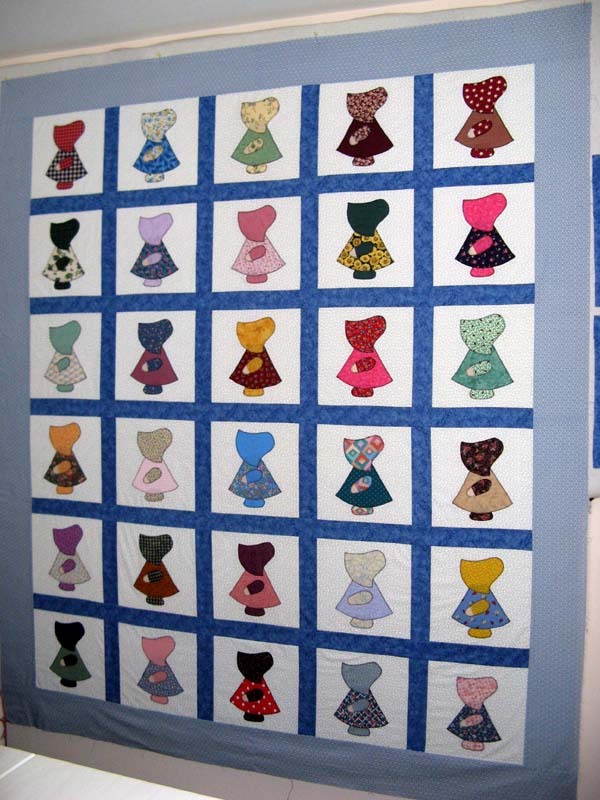 I'll be in my sewing room today working on Violet and Ivy's frocks or hand stitching one of two quilts that need the binding put in place. I finished up two and they are on my website should you wish to view them. Kissin' Korner 2 and Kalvery are complete. 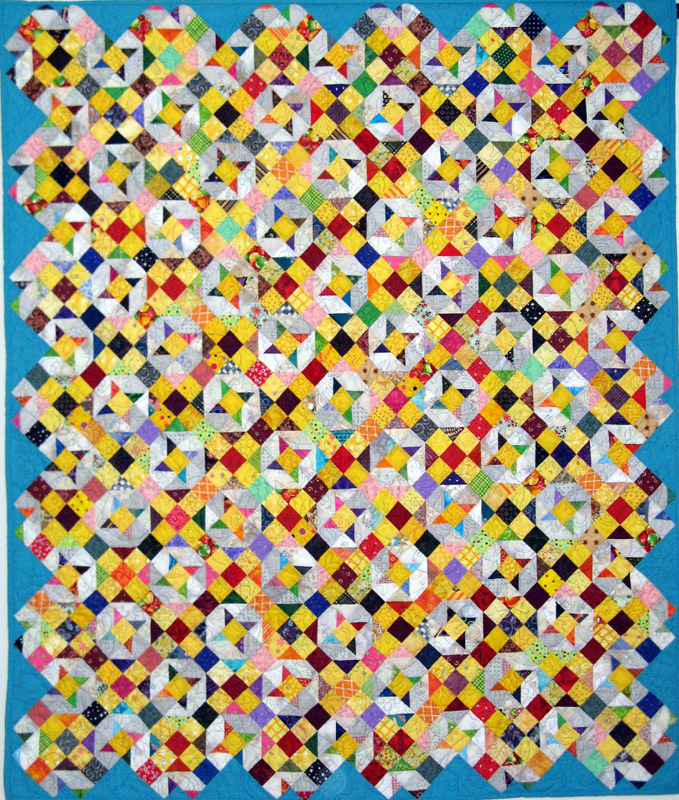 Kakes in the Kribyard came back from Kerry's Quilting this past weekend. 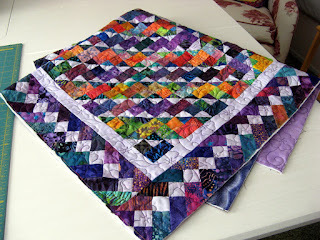 It is really a purple quilt! I have a solid purple planned for the binding. Need to see if there is enough to get around this 33" x 39" project. Kerry also went to a retreat in Texas while Mom and I attended the retreat in Temecula. I got a Dear Jane charm pack as a gift from her trip. 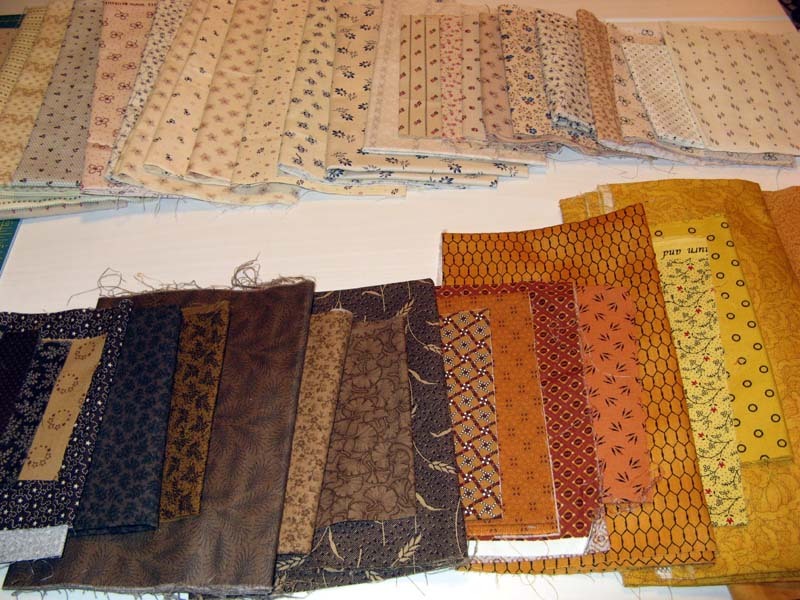 It is a bit difficult to see all eight fabrics. Some wonderful small scale prints in various colors. Thanks Kerry! Violet and Ivy are going to get some cute dresses soon. When I was a Beverly's recently there was an adorable pattern that crossed my eyes. Knowing I had several cute juvenile prints in my stash it had to come home with me. The girls are Kerry's grandchildren that I see often. The top right project is my #12 UFO called for working in July. It isn't a large project, but I will be starting from scratch. 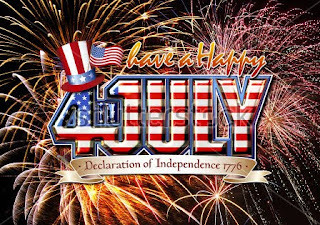 There will be more on Kapture through the month of July. The last of the dresses are done. These and the others last posted about went into the mail on Friday. 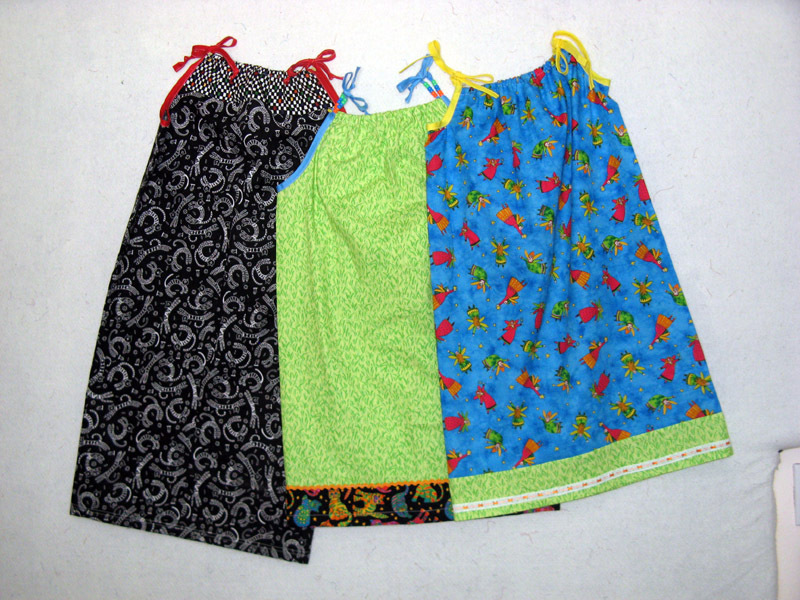 Wish the members of Sunshine Quilters could see the looks on the girls faces as they receive these cute frocks! Nothing to change my statistics this week. My UFO for July is #12. It is a project that starts from a pattern with nothing stitched. It is one of the smaller projects on my list. In the meantime Mom and I will be cutting batting for the projects recently finished. There is also some trimming needed for Kakes in a Kribyard that I got back from Kerry yesterday. 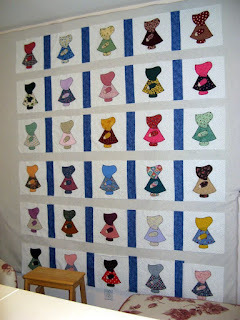 See more of what's going on in my home tomorrow and on my Mom's blog SewWhatElse.